Kim Freeman presents Jill Brown (right) with the DAISY Award. 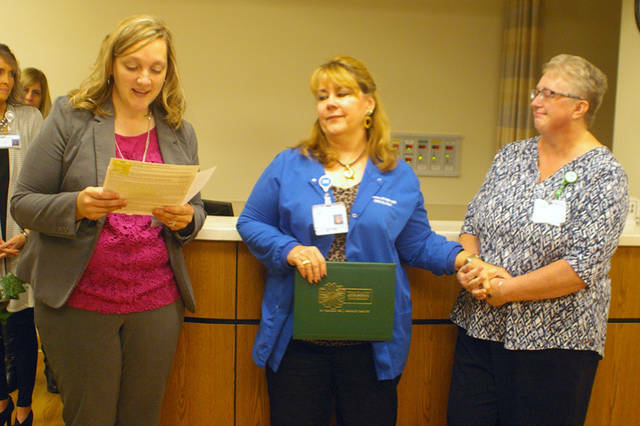 Angie Godwin (right), a Wayne HealthCare employee whose mother was treated for cancer at the hospital, nominated Jill Brown (center) for the DAISY Award. 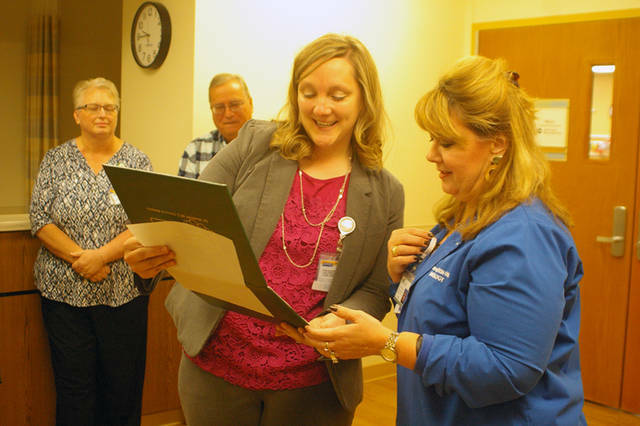 GREENVILLE – Wayne HealthCare staff surprised Cancer Care Coordinator Jill Brown last week with the DAISY Award, an international award that recognizes nurses for extraordinary care. The DAISY Award was created in 1999 by the family of J. Patrick Barnes, who died from complications of an auto-immune disease. His family created the DAISY Foundation in his memory, which now is recognized by more than 3,300 health care facilities and schools of nursing in all 50 states and 18 other countries. Wayne HealthCare recognizes two nurses each year with the DAISY Award, which comes with a DAISY Award pin, a hand-crafted DAISY sculpture, discounts on advanced educational opportunities, cinnamon rolls and more. Brown was nominated for the DAISY Award by Angie Godwin, who works in the Wayne HealthCare billing department. Godwin’s mother was treated for cancer at Wayne HealthCare, she said, and she appreciated the care she received from Brown. Brown always ensured the cost of the chemotherapy was covered, Godwin said, whether it be through health insurance or money from a cancer fund. Wayne HealthCare had numerous nominations for this fall’s DAISY Award, Vice President of Patient Care Services Kim Freeman said, but Brown definitely stood out. “Everything she does, her patients are No. 1, and she’s certainly deserving of the award,” Freeman said. Brown has worked as an oncology nurse for approximately 30 years and has worked at Wayne HealthCare since 2008. She’s inspired by her patients, and they keep her going. For more information on the DAISY Award, visit www.daisyfoundation.org. This entry was tagged DAISY Award, Nurse, nursing, Wayne HealthCare. Bookmark the permalink.